Early morning Kinneret crossing by Bnei Akiva Yeshivot Center and students; 12-year-old takes first place. 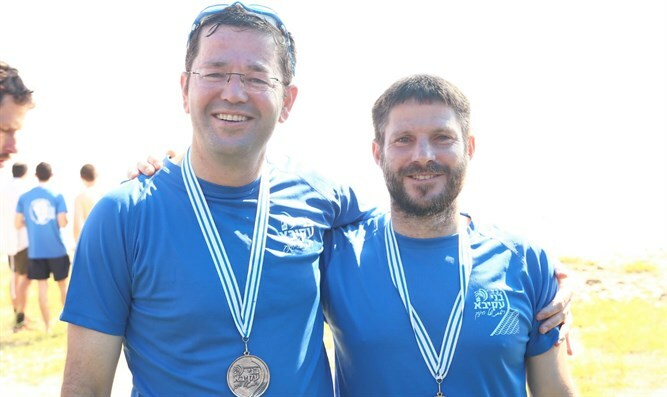 135 swimmers, together with MK Bezalel Smotrich the director of Bnei Akiva yeshivas, Elchanan Glatt, heads of yeshivas and Ulpanot, swam across the Kinneret in the early hours of the morning. The initiative by the Bnei Akiva Yeshivot Center is part of a fundraising project for hesder yeshivas and social projects that the center leads. MK Smotrich said he "wants to strengthen the Torah world, including the hesder yeshivas from which a religious Zionist spiritual leadership may arise." The crossing was divided into four teams and the big surprise was recorded in the kilometer heat, where Elnatan Codron from Yad Binyamin, only 12-years-old, took first place. Bar-on Dasberg of Alon Shvut won the four-kilometer contest. The first Kinneret crossing for men was held to help fund social projects and assist in scholarships for students. Bnei Akiva Yeshivot and Ulpanot have nine hesder yeshivas, each of which has a social project they adopted. Yeshivat Hesder Or Etzion operates the Ohr m'Ophir program, which develops the spiritual and educational leadership of the Ethiopian community. All income from the event will go for the yeshivas' social activities. The crossing was promoted in a gag video in which Israeli politicians from across the spectrum participated, based on a rumor circulating the Knesset that MK Smotrich had abandoned principles in a shocking way.